This project has been published in in Steve Hardy (ed.) Environmental Tectonics: Forming Climatic Change (London: AA Publications, 2008) and in Rachael Stephenson (ed.) Bartlettworks, (London: UCL, 2004), and has featured in many of my talks. This design was developed initially as an entry to the ‘Ephemeral Structures in Athens’ competition which was held in 2003 prior to the Athens’ hosting of the 2004 Olympics. The brief asked for structures which might host temporary urban events (concerts etc) in Athens at the time of the Olympics, and used terms like ephemeral and parasitic in the brief, to describe what they were after. From the start we wanted to explore what an ephemeral and parasitic architecture might be, outside of the usual clichés (enjoyable as they might be on occasion.) Our approach was based upon an analysis of the Athens urban ecology, which made clear that during the summer, the most socially valuable and usable urban space was composed out of shade and cool air. It seemed that any proposal needed to work with this primary condition of the site. We conceived of the architecture of the scheme as the production of environmental conditions, rather than any actual structures. We also wanted if possible to produce a scheme which might leave a legacy to the city after the Olympics. We started with studies which explored shadow creating devices, where an ‘ephemeral’ architecture of shadow might ‘parasitically’ move across existing buildings and urban spaces, defining a transient social space. 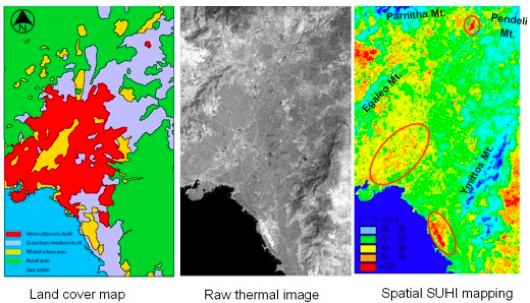 A more detailed study of the urban ecology revealed that Athens has a very particular local environmental condition, known as a ‘heat island’ effect.1 The city has an average summer temperature of 37 degrees Celsius. It suffers from extreme pollution, primarily composed of heavy particles near ground level produced by car emissions. Because the city is surrounded by mountains on three sides, and is relatively sheltered from winds, this pollution builds up to levels which are bad for public health. In addition, because of the high levels of UV light, many of the pollutants acts as a corrosive catalyst which damages the fabric of historic buildings. However, the pollutant particles are heavy, and are concentrated in the first 40 m above ground level. The pollutants and buildings can be understood in eco-cybernetic terms, as a positive feedback loop – that is to say, amplifying the signal of the sun. In this design proposal outlined below, by cooling and drawing down clean air from 60m above street level (above the worst pollution levels), pollution is dissipated, and part of the heat cycle is broken. Once dissipated and dispersed, the pollutants will be safely broken down in the natural environment. The scheme below can be understood as the introduction of a negative feedback loop into the Athenian ecology, allowing the city to self regulate and maintain itself as an organism. The Tower of Winds takes its name from a first century BC structure located next to the Roman Agora in the Plaka area, which contained a water clock, sundial, weather vane and compass. 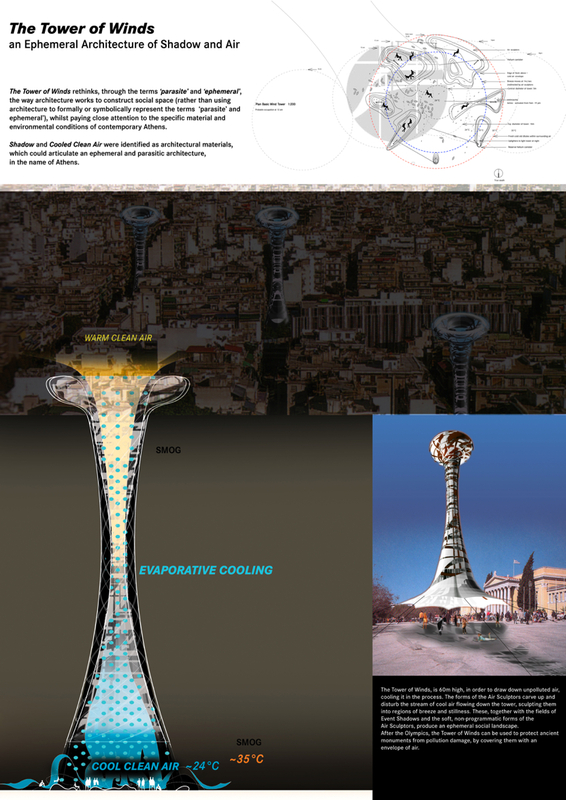 This proposal for a modern Tower of Winds has two orders of figuration within Athens. Firstly, as an object, it is a suspended fabric tower. The fabric is translucent/transparent, and is decorated with a sophisticated opaque patterning, which incorporates PV fabric. The patterning varies across the height of the tower, and is designed to produce different shadow effects from the sun (depending upon the time and place) across the streets and buildings of the city. The cables which hold down the base of the tower are hollow and water is pumped up these tubes, which spiral up around the tower. These water tubes have small holes facing onto the inside which allow small amounts of water to weep out and run down the inside of the tower. This water evaporates, and because of the effect of the latent heat of evaporation, energy is taken out of the air inside the tower, and it cools. A draft is then created flowing down through the tower, and clean air is then drawn down through the top of the tower from above the pollution level. As the worst pollution in Athens is primarily particles at or near street level, the air that is drawn down from 60m is relatively clean. 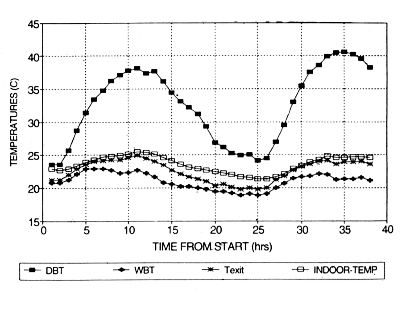 The effects of evaporative cooling in the tower would be sufficient to generate a pleasant light breeze, and a temperature drop of around 11° C during the day. By cooling and drawing down clean air from 60m above street level (above the worst pollution levels), pollution is dissipated, and part of the heat cycle is broken. At night the process reverses and warm air generated from the heated urban fabric is funnelled away up the tower. If multiple towers were used throughout the Athenian summer, there would be a significant amelioration of the heat island effect, and a corresponding increase in public health. The form of the tower is a minimal surface (similar to those generated by engineer Frei Otto, by spinning an oil film. These forms have been demonstrated to generate the greatest airflow. However, the tower is not actually the architecture. The architecture rather, exists as produced fields of shadow and fresh air which parasitically and ephemerally inhabit the city streets and buildings. Shadow is a component of the classical architectural cannon, as both decoration and shelter. It is also a valuable social space during the Athenian summer. Individuals and groups tend to congregate in the shade of buildings and pavement cafes. The Tower of Winds produces a mixed and changing field of social space, composed of regions of light and shadow, and cooled fresh air. By introducing free fields of cooled clean air and shade, new, ephemeral programmatic and social inhabitations are generated. As a parasitic architecture, the Tower of Winds lives off of the polluted, ‘heat island’ environment of the host city. Whilst it is a response to the ‘Landmarks of Olympic Activities’ theme, it can also coexist with and parasitically modify the local environments of other ‘ephemeral structures’ (for example the Open Air Theatre.) The Tower of Winds is so programmatically unspecific, it could be used in conjunction with other structures and programmes. Due to its size and presence, it will act as a Landmark structure and landmark icon for the Olympics. The Tower of Winds has three configurations. The main fabric tower is made of mylar sheets, which can be transparent, opaque or coloured. It is 60m high, and is suspended from a helium inflated upper ring. It can be erected by two people, and can be carried in a car. It is tied back at ground level by being connected to a range of ‘Air Sculptors’. These are rubber sacks filled with water, which sculpt the downward breeze and create lounging and seating territories at the base of the tower. At the base of the tower are the Air Sculptors. These are Kevlar reinforced rubber sacks, and are filled with water on site. This provides the weight to anchor the tower. This water feeds the pumps which are located on steel plates (which the tension cables of the tower screw into) under the Air Sculptors. The pumps, together with the night lights (also contained in the Air Sculptors), are powered by electricity generated by Photovoltaic sheets on the surface of the tower. The pumps circulate water through narrow, perforated tubes on the inner surface of the tower. The sound of the pumps is insulated by the water of the Air Sculptors. The pumps deliver 100 litres of water per day. The Air Sculptors contain enough water to supply the tower for many weeks. During this period, the Air Sculptors slowly deflate, create new forms and social spaces.The undulating soft surfaces of the air sculptures interact with the fields of cool breeze, and varied shadow patterns, to generate a dynamic and programmatically non-specific terrain or playscape, within the space of the city. The forms of the Air Sculptors are designed to carve up and disturb the stream of cool air flowing down the tower, sculpting them into regions of breeze and stillness. These, together with the Event Shadows and the non-programmatic forms of the Air Sculptors, produce an ephemeral social landscape. A: The sun hits the photovoltaic film which is patterned on the surface of the tower. This generates electricity for the pumps. B: The pumps send 100 litres of water per day up the small perforated pipes that spiral up the tower. C: The water evaporates from the inner surface of the tower, cooling the air. D: The cooled air drops at a velocity of 1m per second, pulling down more clean air from the top of the tower. E: At the base of the tower there is 10-12 degree drop in temperature, with a breeze of 1m per second. This breeze is carved up by the Air Sculptors, which together with the Event Shadows, defines an ephemeral architecture. F: At night, the air warmed by the heated urban mass rises away through the tower, which acts as a stack chimney. A: Car arrives at site. B: Take the tower fabric, Air Sculptor forms, pumps, cables and helium canisters out of the car. C: Place Air Sculptors in position, and fill with water from local supply. D: Fix the cables between the tower fabric and the Air Sculptors. E: Pump helium through the tubes running up the fabric, to begin filling the inflatable ring at the top. F: The helium ring rises, and pulls the fabric up into form. 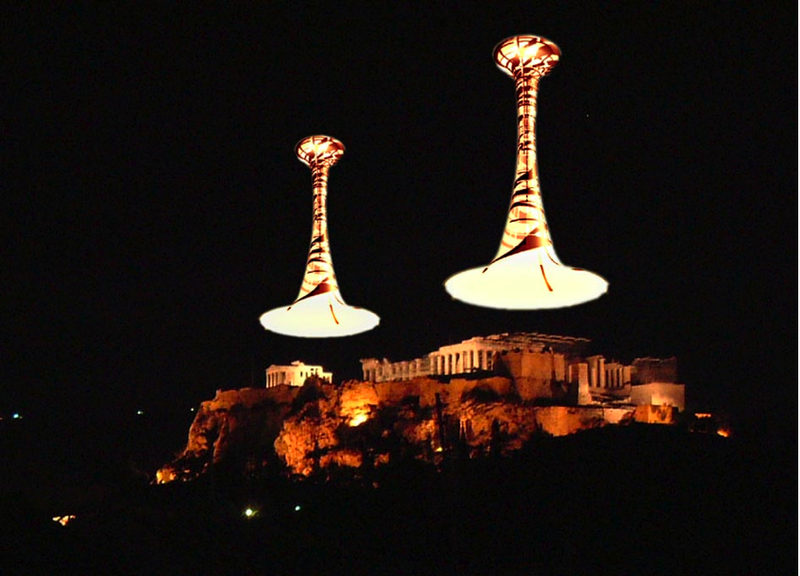 G: As there is very little wind in Athens, the tower does not need any further support or restraint. It will be deflected by up to 15 degrees in light winds. If there is a stronger wind, then there will be no need for the tower on that day in any case. H: In tight, urban situations, the tower might be restrained by fixing cables connected up its height, to nearby structures. I: Once erected and operational, the water running up its pipes will provide some stiffness to the structure. A: The water supply is switched off, and the moisture in the system is allowed to evaporate. B: The helium is pumped back down the pipes into the canisters. C: The tower slowly drops, and is folded up. D: The cables are disconnected from the Air Sculptors, and the folded tower fabric, cables and canisters are put in the car. E: The remaining water in the Air Sculptors is pumped out and used to clean the site. F: The empty rubber forms of the Air Sculptors are folded and placed in the car. The patterning of the fabric of the Tower of Winds creates the event-shadows, which, along with the sculpted cool breeze, define the social space of the Tower of Winds at ground level. The shadow patterning is generated out of the diagrid of the minimal surface of the tower. This diagrid defines the seaming of the fabric, and the routing of the water and helium pipes, and the wire runs for the photovoltaics. The shadow pattern is developed to generate specific social territories and conditions. These conditions are defined by the movement of Athenian sun, the urban grain of Athens, and the social situations we want to encourage through the occupation of shadows. These criteria have determined the density, grain and figures of the patterning. This diagrid defines the seaming of the fabric, and the routing of the water and helium pipes, and the wire runs for the photovoltaics. The curved macro pattern is developed onto of the diagrid, and sets the increasing density of shadows at the base of the tower. The orthogonal micro pattern is overlaid, and is used to set out the grid of Photovoltaic film. It gives richer grain to the shadows, encouraging a variety of event based occupation. Specific symbols, such as the Olympic logo, might be generated as shadows.The overall pattern generates a shifting range of shadow configurations as they parasitically occupy the surfaces of the city. Low-density regions of configured shadows create spaces for individuals and small groups. Medium density regions of configured shadows place individuals and small groups in relation to one another. High-density regions of configured shadows place groups in relation to one another. Regions of dense shadow can be occupied by groups for various activities. The morning and evening sun with pass twice through low-density pattern regions, creating dappled patterns (like tree leaves) as it passes over streets and buildings, and into people’s apartments. There have been a few crazy schemes proposed in recent years, which have suggested that the Acropolis should be covered in a glass box, to protect the buildings from corrosion during the most polluted periods. In this proposal, there is no need for such permanent constructions. Instead, on the worst pollution days, a pair of wind towers can be erected over the Acropolis, protecting it with an envelope of clean air rather than glass.